Derrick Johnson said Gov. Northam had ample opportunity to address his past. The photo, which appeared on Northam's medical school yearbook page in 1984, shows two people, one in blackface and the other in a Ku Klux Klan robe and hood. Northam graduated from Eastern Virginia Medical School in Norfolk, Virginia before joining the Army. Johnson first called on Northam to step down Friday evening in a tweet, saying "Black face in any manner is always racist and never okay. No matter the party affiliation, we cannot stand for such behavior." As calls for Northam to resign have intensified, Virginia lawmakers are already floating their next moves. Del. Lamont Bagby, D-Va., the chair of the Virginia Legislative Black Caucus, said on "This Week" Sunday that he's not ready to discuss potential impeachment, but reiterated his call for Northam to resign. "I encourage the governor to step aside so we can start the healing process," Bagby said. "I hate to be on the other side of virtually all of my friends on this, but I do disagree with their judgement because I think it is a rush to judgement," Moran told Stephanopoulos. "I really don't think that we should be judging the basis of the mistakes people have committed in the past as much as whether they have learned from that past to bring us forward," Moran added. Stephanopoulos pressed Moran on his argument that Northam should stay in office, pointing out that it would be almost impossible to govern when so many have called on him to step aside. "I don’t think these public shamings really get us all that much," Moran said. "I think we’ve done this several times and we retreat into our corners where we’re most comfortable and it just exacerbates the tribalism that confronts society today. I think that he understands where people are coming from, but he knows where we need to go." Late Friday, Northam issued an apology and acknowledged that he had appeared in the photo, though he did not specify whether he was the individual in blackface or the KKK robe and hood. "I am deeply sorry for the decision I made to appear as I did in this photo and for the hurt that decision caused then and now," Northam said Friday. The next day, in a news conference at Virginia's Executive Mansion, Northam reversed his statement and claimed he was neither of the individuals in the photo. "I will not excuse the content of the photo. 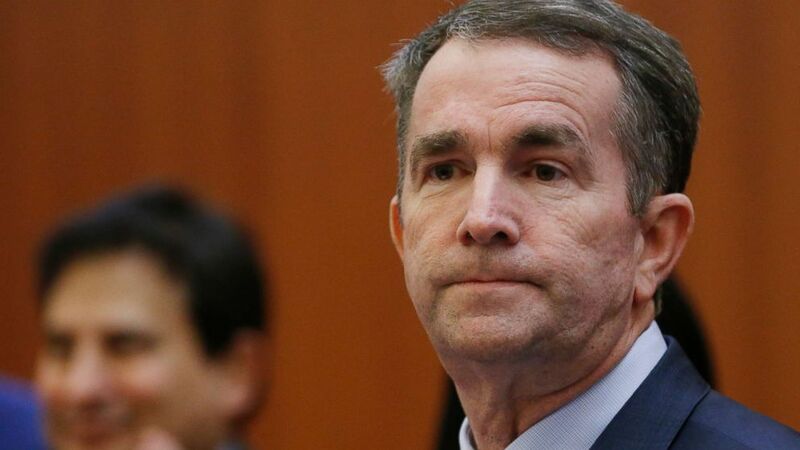 It was offensive, racist and despicable," Northam said on Saturday. "I believe now that I am not either of the people in that photo," Northam added. While Northam now disputes his appearance in the yearbook photo, he did acknowledge an incident in San Antonio in 1984 in which he said he "darkened" his face with shoe polish as part of a Michael Jackson costume. Northam said he recognizes now that was wrong. Johnson said on "This Week" that Northam should have disclosed such an incident preemptively, instead of waiting for a moment like this. "None of us are perfect. Many of us have had issues in the past," Johnson said. "The most effective politician's way to address this is to disclose early, acknowledge it and seek ways in which you can make amends to the community that's offended and begin to work hard to heal any injuries that have been caused." Beginning Friday evening and continuing through the weekend, politicians across the country have called for Northam to step down as a result of the image. Late on Saturday, Sens. Mark Warner and Tim Kaine, D-Va., and Rep. Bobby Scott, D-Va., joined their colleagues in calling for Northam to resign in a rare joint statement. Both the Republican and Democratic party offices in Virginia also called for Northam to resign. During Northam's news conference on Saturday, the Democratic National Committee weighed in, with Tom Perez, the DNC chairman, calling for Northam to resign to allow Lt. Gov. Justin Fairfax take over as Virginia's governor. "His past actions are completely antithetical to everything the Democratic Party stands for," Perez wrote. "Virginians and people across the country deserve better from their leaders, and it is clear that Ralph Northam has lost their trust and his ability to govern."